Well, I met David Wondrich last Thursday. Yes, I could heap applause and accolades upon him, but that’s been done enough already. I’ll just say that Mr. Wondrich was an affable, approachable guy who loves his cocktails, and that all of us who attended the book signing — a surprisingly low half-dozen or so — thanked him for his work and wished him well. A few of the more vocal enthusiasts went on to trade some spirits info with him. I did, however, ask what he was up to at the Atlanta Food & Wine Festival this past weekend. For those who attended — I was not one of them — he was in a tasting seminar discussing southern drinks (I know Savannah’s Chatham Artillery Punch was mentioned in there somewhere). Mr. Wondrich also mentioned that he wished he could spend a bit more time here in Atlanta — the Manhattan Cocktail Classic is also occurring this week, and he’s one of the imbibers behind it — and that he had frequented the city’s clubs back in the ’80s, playing bass at such venues as the 688 Club on Spring Street. Yup, he played bass, way back when. Along with the autographs, I picked up a bottle of Carpano Antica and a (just-released) H&F t-shirt. A pretty good haul. Oh, and I met the local USBG President, Brittany Chardin, who also loves Carpano (did you know it’s sometimes served with olives?) and mentioned that there’s an open-house night coming up at the end of May (more info on that later). All-in-all, a pretty low-key event. If there’s one bar in town that credited for kicking off the cocktail scene in Atlanta, it’s probably Holeman & Finch. That’s a bit of a grand statement, I know, but mostly true. 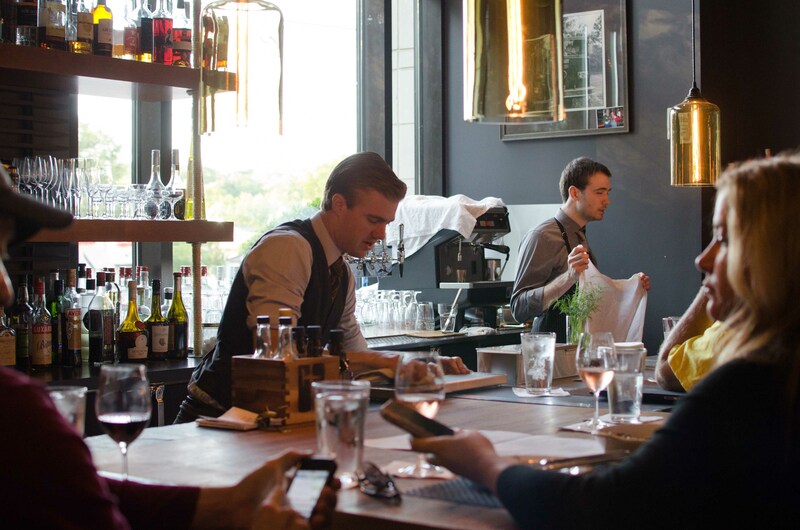 The pub started as an offshoot of Restaurant Eugene, located next door. When the popularity of the restaurant’s cocktail/pub food program outgrew the original space, Greg Best — leader of said bar program — moved the whole operation next door, and it’s had nothing but success since then. I was dining solo last Thursday, so I headed to the right of the entrance, where the bar and several small tables lay, and all of which were full (darn) except for the stools along the brushed metal wall. I normally like to sit at the bar and pick the minds of the bartenders, but unfortunately, no, didn’t happen that night: should have gone before the book signing! Ah well. The place was pleasantly busy, and from the sidelines I could watch the cocktail-slingers at work. 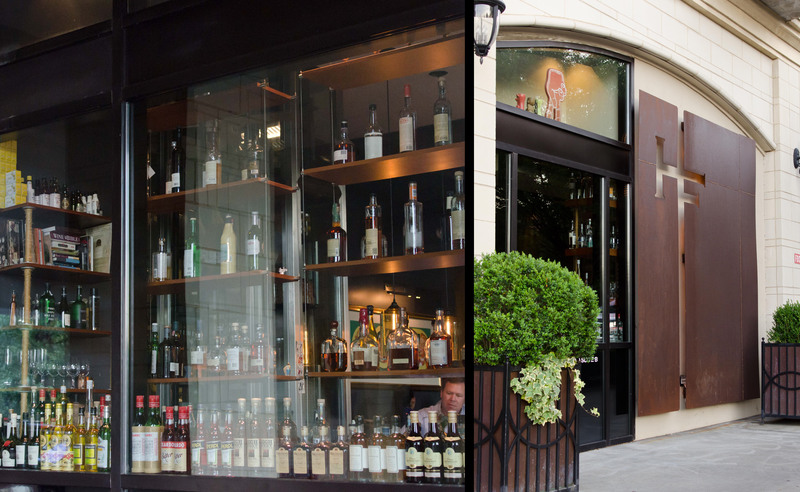 I should mention that H&F has a fantastic stock of liquor (perhaps not displayed as impressively as at Leon’s) that’s on view from the outside. Only the original drinks — about ten or so — are on the drinks menu, but the bartenders know all the classics, and there’s at least one only-ordered-by-those-in-the-know drinks, the Southern Cola. Having tasted it once before on a tip from friend Jack, I made it my opening beverage. Pour the amaro into an old-fashioned Coke glass, add in the Coca-Cola, then drop in the ice cube. Stir a bit to chill and melt some of the lime juice. 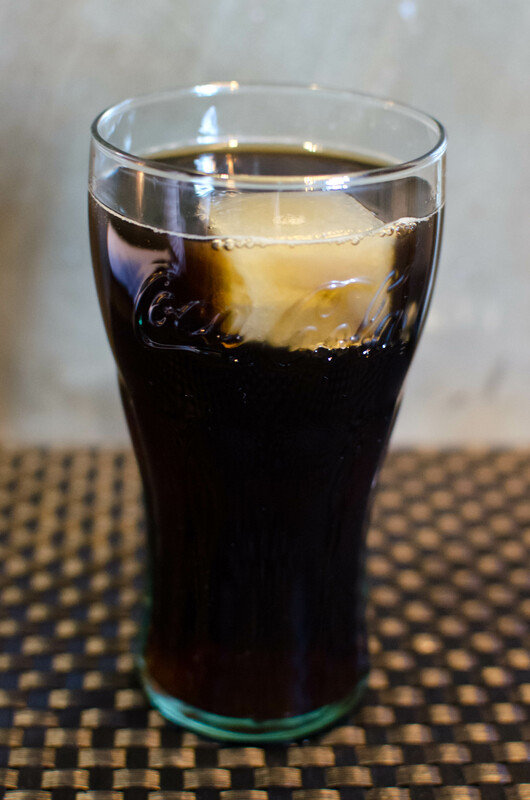 As Greg Best has said, Coke and amaro have a natural affinity for each other — in many ways, our sodas have a similar profile to Italian amaro, but we’ve removed bitterness from the equation. In the Southern Cola, that bitterness is added back in (don’t worry, it’s nothing like Campari), balancing out a bit of the sweetness from the Coke. CioCiaro is very nice, and one of my favorite amari in terms of flavor — not quite as harsh as Fernet Branca or as sweet and funkily floral as Meletti, colored with earthy, herbal flavors. Oh, and that lime ice cube? It melts as you sip, adding more and more tartness as you go along. Drinking speed will determine how much lime your taste buds receive. Coca-Cola made with corn syrup will work here, but I find it to be sharper and stickier than that which is made the old-fashioned way, with cane sugar. I regularly buy Mexican Coke by the half-liter at the local Super H-Mart. Dinner arrived soon after the drink — Farm Egg and Pancetta Carbonara — and it was delicious, though I think I would’ve tossed a bit more pancetta in the bowl (can never have enough pig!). 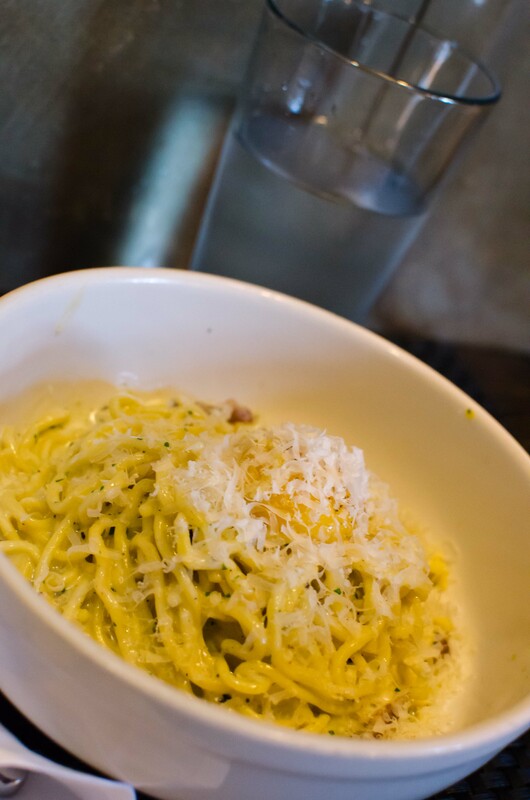 The eggy, cheesy pasta helped soak up the minimal amount of booze I was ingesting that night. For those who haven’t ordered food at the pub, they focus on cured meats — which hang in a case separating the bar and dining area — “whole-hog” offerings, and produce purchased from local farms. There’s also the mythical 10 o’clock burger — twenty- four served per night. After the creamy pasta dish, I needed something to finish off the night that would allow me to drive back home to the suburbs, so I asked the bartender which amari they stocked. 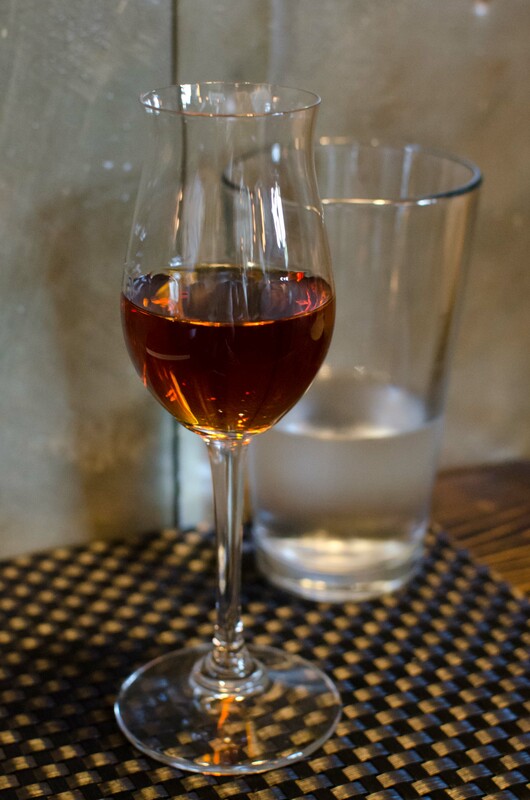 Amaro Montenegro was on the list, and I’d never tried any (“One of our owner’s favorites,” he said), so the choice was made. Besides, I’d been hoping to try it for some time. The Montenegro has a wonderful, citrus-touched spiciness to it, with notes of cinnamon and coriander, plus orange peel and something else that’s vaguely familiar, yet undefinable to me (Some have said it’s tangerine). As a side note, I love those tulip glasses. I checked back at the Bottle Shop before heading home, but alas, the Montenegro was out of stock. Things to do in the future? Return and get some Montenegro, then run by the bar for an original cocktail. Next time, H&F, next time. This entry was posted on May 15, 2012 by IJ Lauer in Amari, Atlanta Bars, Bar Visit, Coca-Cola, Drink Recipe and tagged amaro ciociaro, amaro montenegro, atlanta, autograph, bar visit, book signing, coca-cola, coke, david wondrich, h&f bottle shop, holeman and finch, lime ice cube, review, southern cola.